Basques, petticoats, corolla skirts, pointed shoes, bright-coloured floral and striped prints, wasp-waist suits with straight skirts, strapless sheath dresses, cocktail dresses, rock crystal embroidery: such was the couture of the fifties. At the same time, though, a more relaxed style – close-fitting pullovers, pedal pushers, jeans – was being adopted by the baby boom generation. 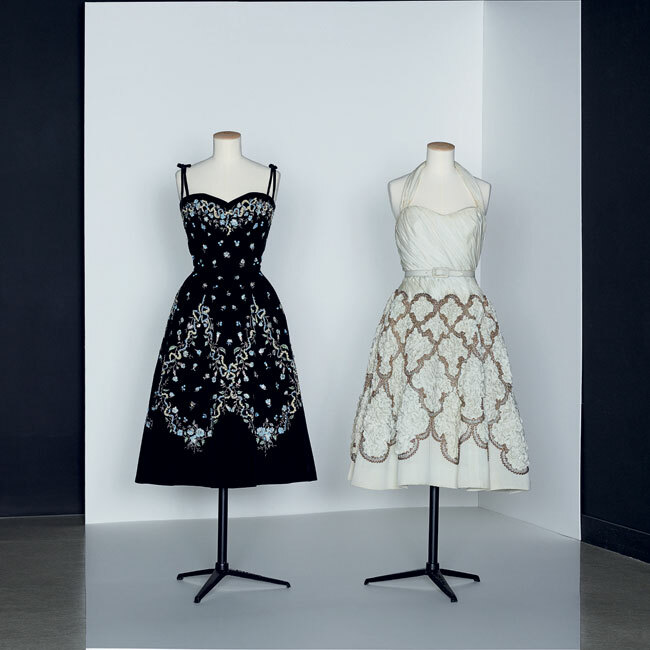 Highlighting fashion in the 1950s, this new exhibition spotlights Christian Dior’s first collection in 1947, which revolutionized fashion and femininity with its “New Look,” but also competing styles such as Balenciaga’s ‘barrel’ line with its flared back and waist, or the dramatically innovative Chanel line of 1954 with its simple, straight suits. Over 100 pieces of clothing and accessories make up the exhibition, featuring pieces from the most famous couturiers as well as others now forgotten, such as Jacques Fath and Jacques Heim.